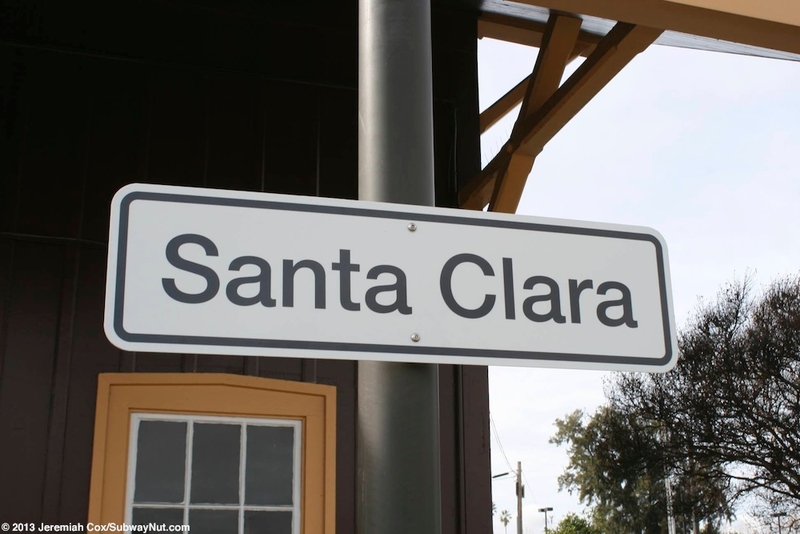 Santa Clara (–University — only used by Amtrak, not on any signs, to distinguish this stop from Santa Clara-Great America about 4 miles north) was the oldest continuously operated train depot in California until Caltrain closed the ticket office in May 1997. 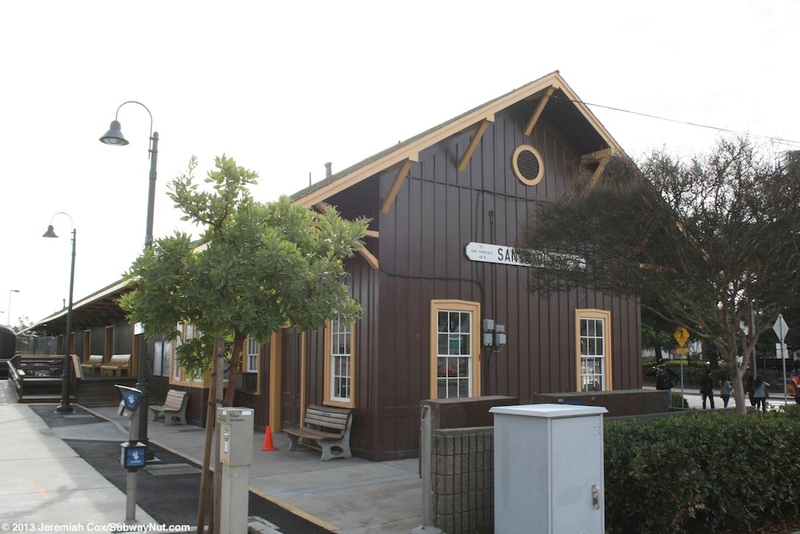 The wooden station opened in late 1863, the full Peninsula/Caltrain line to San Francisco wasn't completed until 1864. 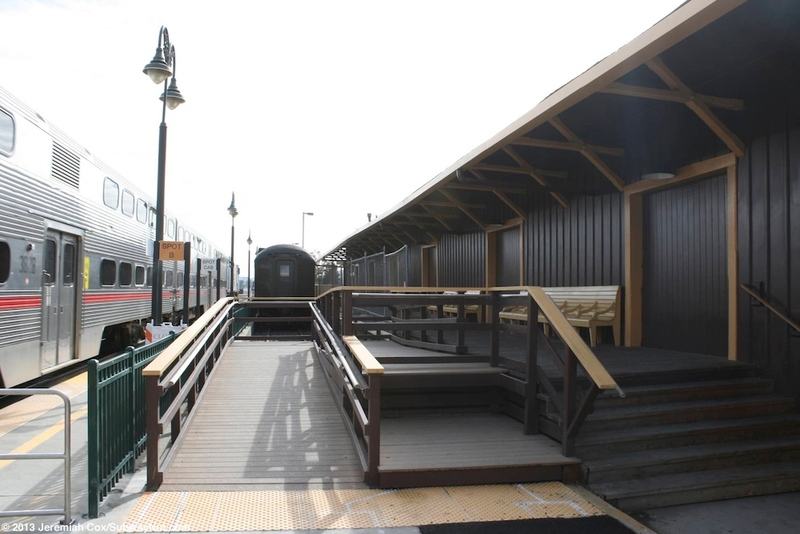 The depot was moved slightly to be attached to a freight house in 1877 but is largely the same as it was back in 1863. 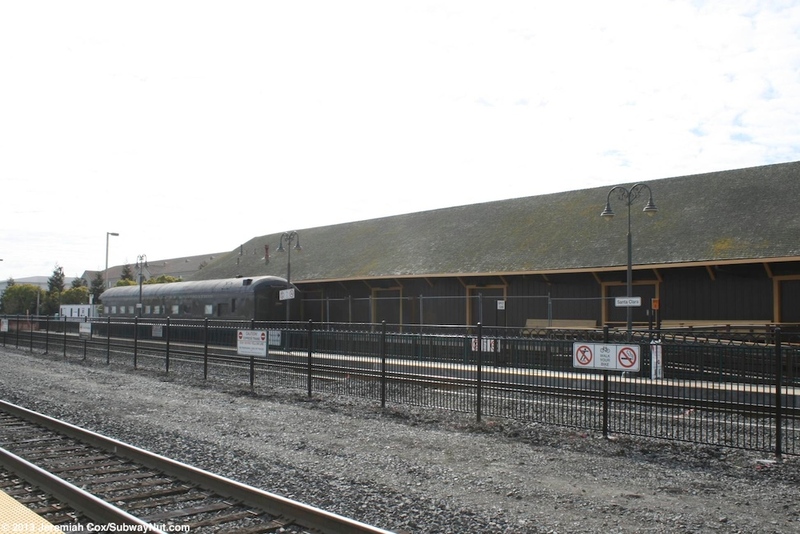 Today, the interior of the dark brown depot with lighter brown trim, is home to a small Museum of Railroad History and some Model Railway Layouts run by the South Bay Historical Railway Society that was partially formed to preserve the depot in the mid 1980s. 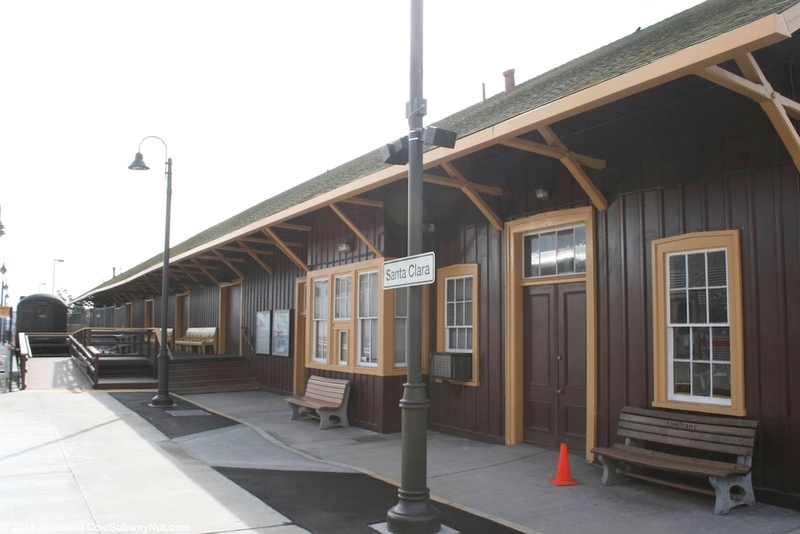 They also maintain the Santa Clara Tower at the northern end of the main platform that is in the same style as the historic depot and compliments the historic station's design well. 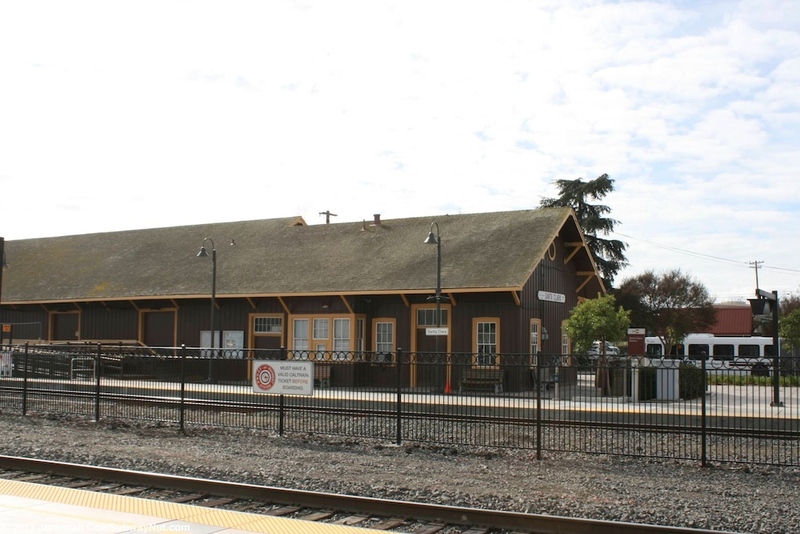 The station is just south of the junction where the Peninsula Line to San Francisco (Caltrain) and Mulford Line to Oakland (used by Amtrak and Altamont Commuter Express) diverge and the tower saw continuous operation controlling this junction and the Santa Clara yard just south of the station until July 17, 1993 when centralized train control was instituted and the tower was rendered obsolete but has been preserved. The station was originally just a simple station with the depot on the west side of the tracks. 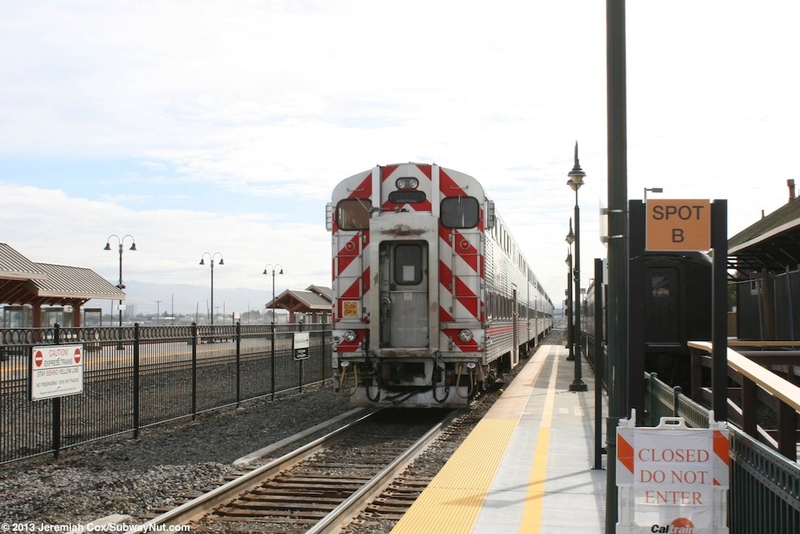 It was a hold-out station with a single side platform along the San Jose-bound Peninsula Corridor Track (that still exists) and level-crossings to a narrow no-clearance island platform so passengers could board trains on the next track out mainly used by Peninsula Line San Francisco-bound trains. 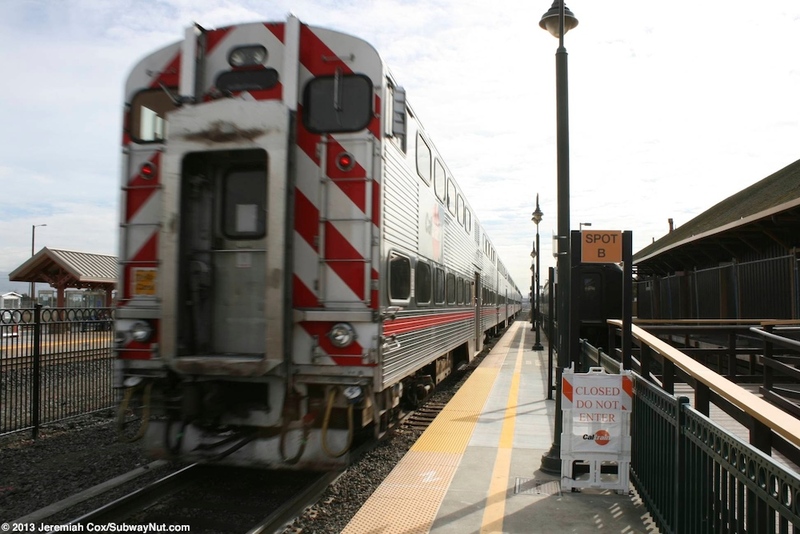 These trains have always served the station and today the station receives service from most Local and Limited Caltrain tripes except no Baby Bullet Express trains call at the station. Service on the Mulford, Oakland Line (in modern times) has been much more recent; the Altamont Commuter Express added the station as a stop (its only infill station ever and stop that wasn't served when the line began operations in 1998) on March 5, 2001 with then three daily round-trip rush hour trains. 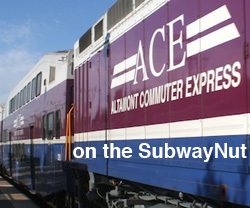 The completion of the Caltrain Express project that resulted in more frequent rush hour Caltrain Service (and the addition of the Baby Bullet Express Trains) led ACE service to be temporarily suspended because of construction of a long-term fix for the hold-out rule (a shuttle was provided to and from Great America) on August 9, 2005. 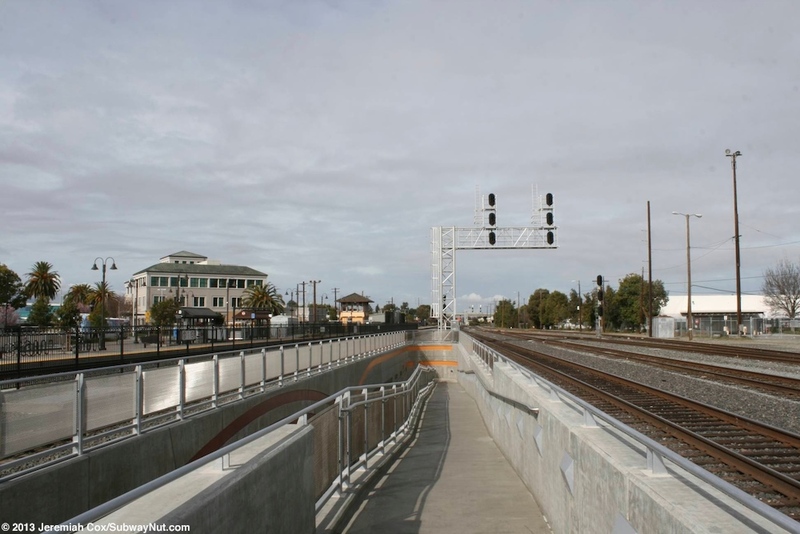 The long-term fix to allow more service on the Oakland Line, remove the hold-out rule for Caltrain, and make the station ADA compliant and wheelchair accessible was a major project. It realigned the tracks and built a new pedestrian tunnel to a new modern island platform shared by the San Francisco-bound Caltrain Track and single track used (the farthest one from the depot) by Amtrak and ACE, there are a still a few more tracks beyond the station that are used by freight trains (and can be used by the bypassing Amtrak Coast Starlight). 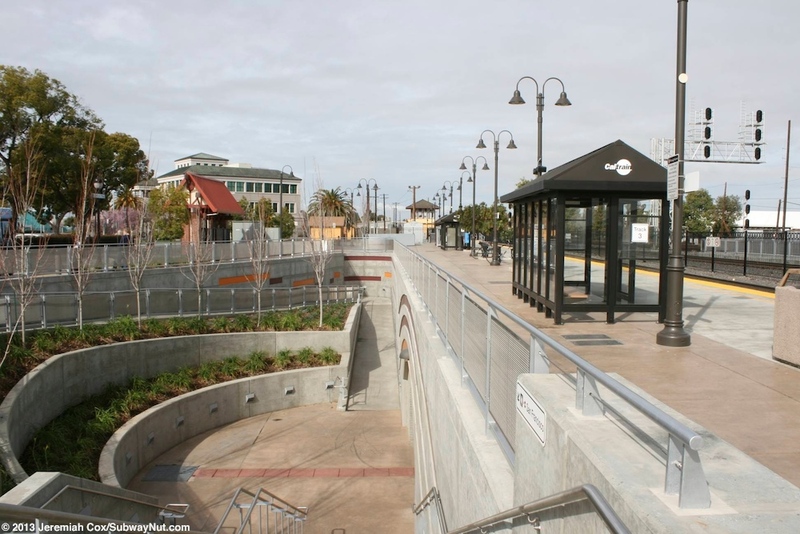 The new island platform opened for Caltrain customers on December 19, 2011. 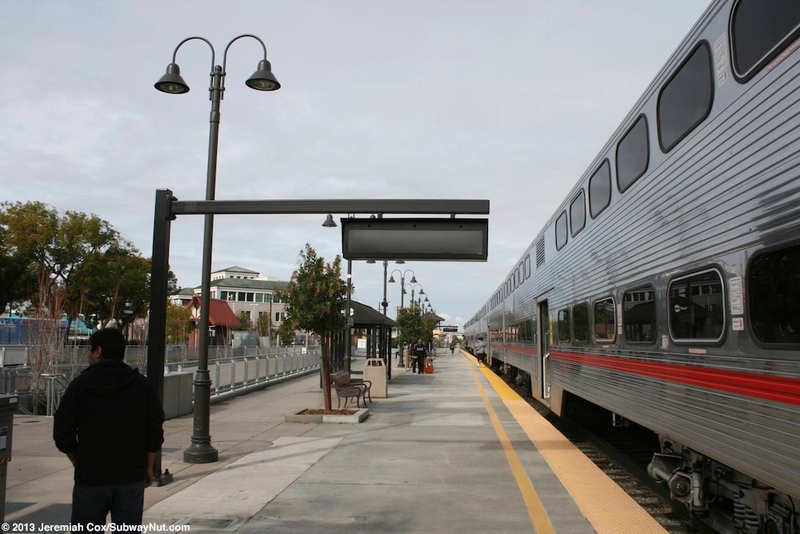 ACE Train service was finally restored in May 2012 and Amtrak's Capitol Corridor, with all 7 San Jose-bound round-trip trains stopping at the station effective May 18, 2012, making the station an Amtrak stop for the first time. 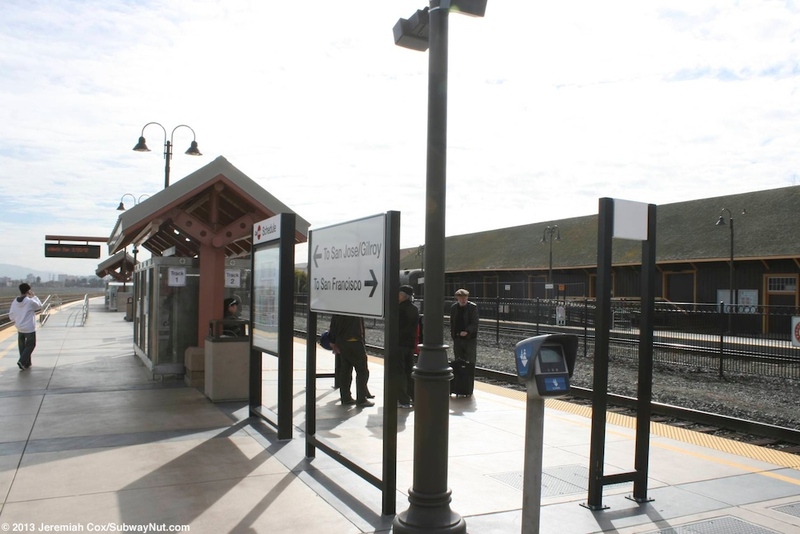 The LED information panels at the station only display Caltrain information, nothing is provided for Amtrak. VTA Bus Route 10 the Airport Flyer, that runs fare free, connects the station with the San Jose Airport (and the Metro Light Rail Station). Other bus lines also stop at a number of bus stops on Railroad Avenue that curves around the station both adjacent and just southeast of it around it. The farthest stop is nearly a block away from the station. Bus passengers get nice large canopies held up by bricks in the style of the historic station to wait under. The current two station platforms are slightly offset from each other. The San Francisco-bound Caltrain track has also been relocated so there is quite a gap (could fit one, possibly two more tracks) between the two tracks used by Caltrain. There is a new requisite fence between the two tracks. 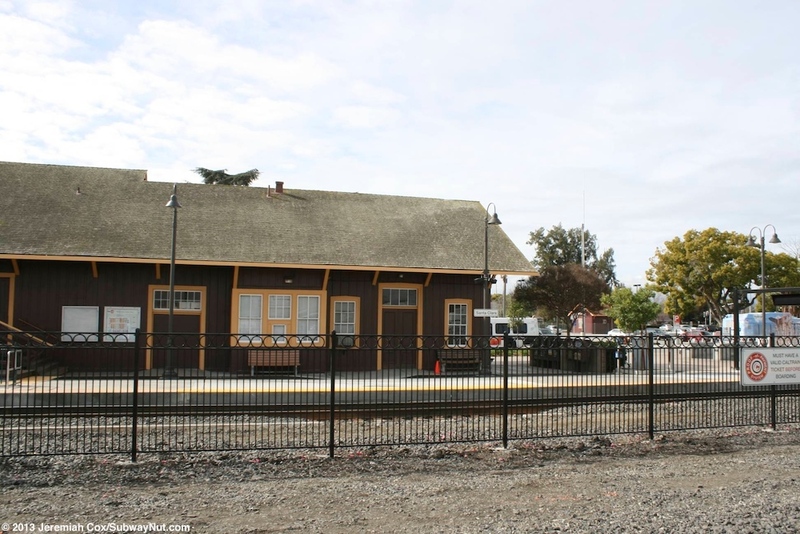 The still basically original side platform (for Track 3) has the historic depot along its southern half and a number of bus shelters along its northern half. The area behind this portion of the platform (which was originally a small parking lot) is a new, nicely landscaped concrete entrance area to the new underpass. The entire station now is along Railroad Avenue that loops around from El Camino Real (Benton Street on the north side) with most parking (there are 289 spaces in total) in a lot bounded by these streets. There is a second narrow lot at the southern end of the depot that extends south. Towards the end of this lot (way beyond the end of the side platform) is the emergency grade crossing (normally the fence in the middle of it is locked tight) off the southern end of the island platform that runs farther south. The island platform is has been given modern canopy structures with pink framing holding up angled roofs. 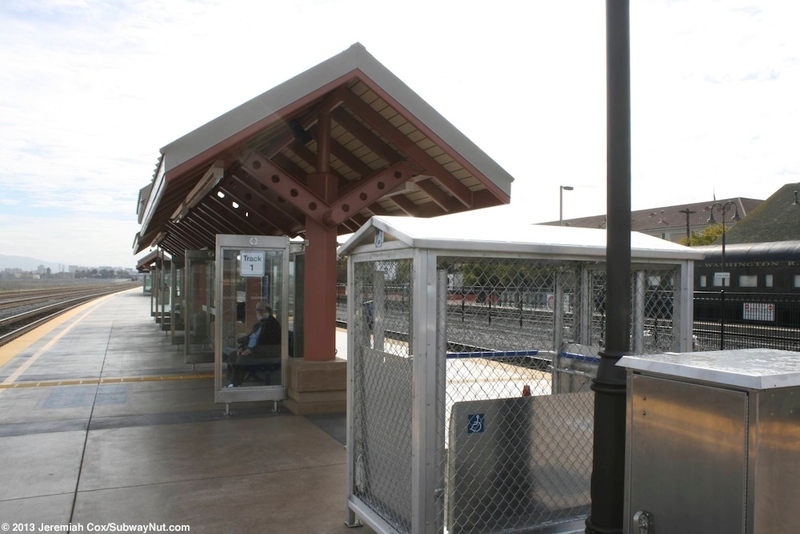 For waiting passengers under these are benches surrounded by windscreens of silver metal and glass with Santa Clara written in black text above these windscreens. Under the northern end of the northernmost canopy is Amtrak's single QuikTrak Machine that anyone coming up from the new tunnel sees. 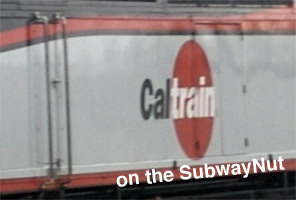 There are also some more Caltrain TVMs (some are also on the side platform). 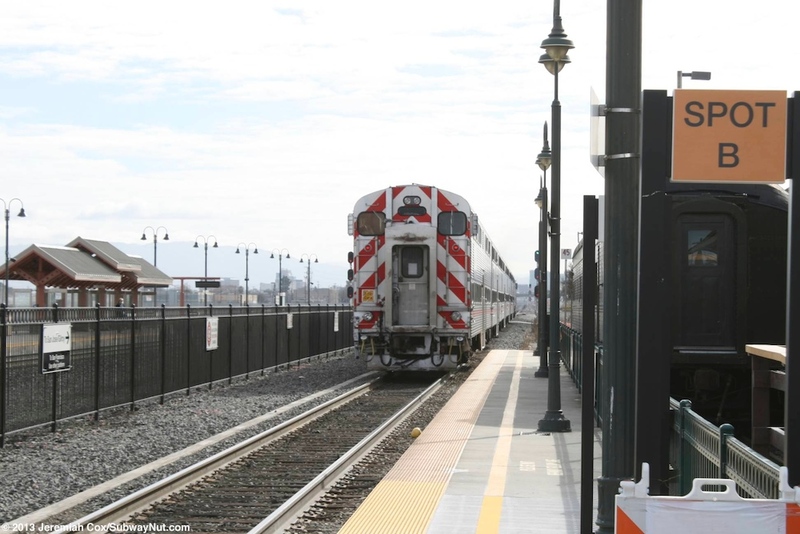 Signs along this platform remind passengers to check before boarding if their train is Caltrain, ACE, or the Capitol Corridor (signs throughout the station use the Capitol Corridor and not Amtrak's logo). 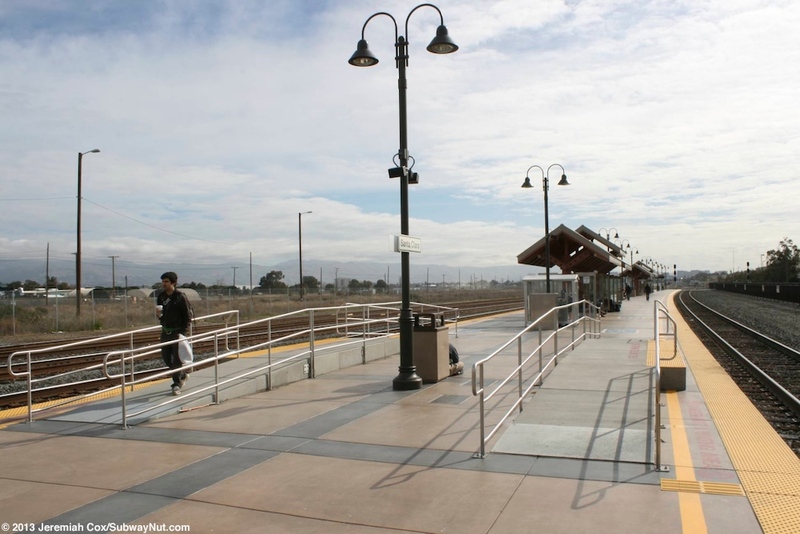 Accessible features include the normal blue Caltrain Accessible help please bench, a mobile-lift and mini-high concrete ramps up for Bridgeplate boarding to the Bombardier BiLevel Cars used by ACE and a portion of Caltrain's fleet (normally used on Baby Bullet Express trains that bypass the station). 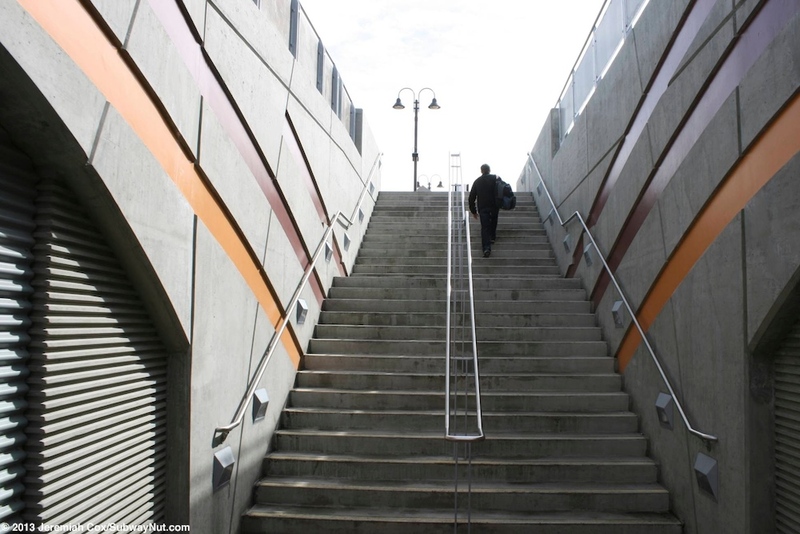 To leave the island platform at its northern end is a staircase and ramp that loops around and up to the platform. 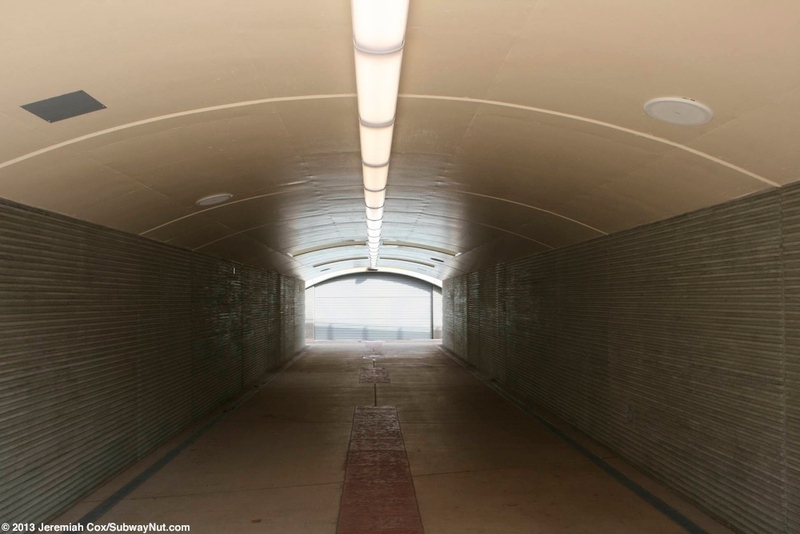 This concrete portal is decorated with bans of light and dark brown clearly to compliment the historic depot. 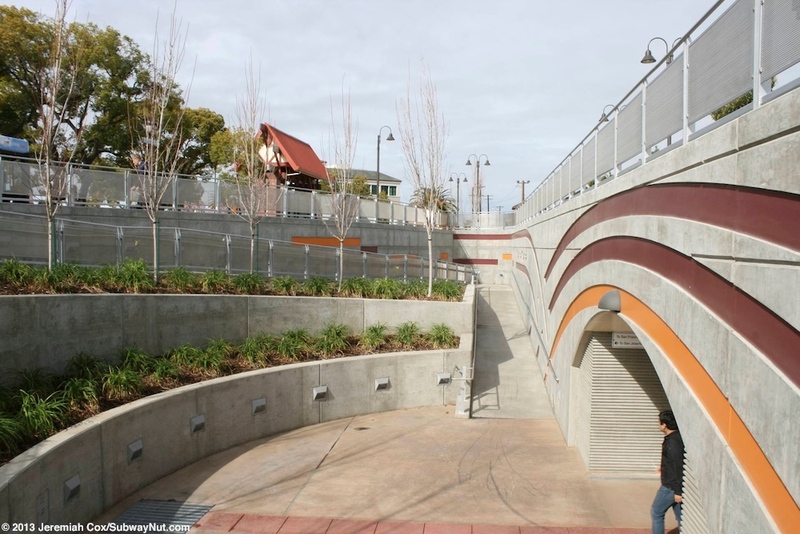 A nice modern concrete tunnel (with a well lit white roof) leads to a nice wide underground area with enough extra space for some landscaping and trees with similar brown color bands (and Santa Clara spelled out) up to the side platform near its northern end.